Stay organised with a fun and functional A5 calendar 2019, designed entirely by you! Our specialist calendar printing service allows you to upload a different photo for every month. Start your calendar from any month you wish, so you have a calendar that is perfect for your needs. They make wonderfully thoughtful and useful gifts, and as they come in packs of two, you can have one at home and one in the office. As well as uploading photos for every month, you can also include a line of text under the image. Treat yourself to a new calendar and get your new year off to a great start. At Bags of Love, we specialise in photo calendars printing, and these handy A5 calendars will make your life so much easier. The calendars come in a pack of two, so you can enjoy yours in more than one room. Or why not give one to someone special as a gift? 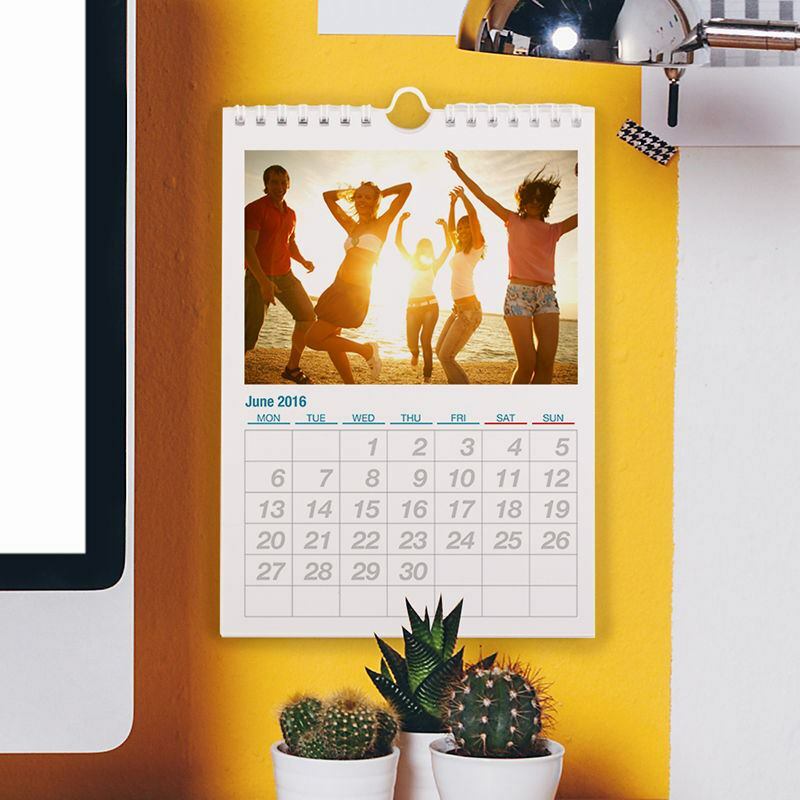 You can customise your calendar with a different photo for every month, as well as a line of personalised text. The high quality, glossy paper enhances the intricate print quality, ensuring your photos look their absolute best. Start your calendar from any month you wish and enjoy a structured daily routine. Your A5 calendar 2019 will fit in nicely to any room of the house and even your office. Design yours to suit your decor and enjoy uploading photos of friends and family. These gifts were fantastic - great quality, delivered really quickly and went down an absolute treat with the family!! I'd definitely recommend them to anyone...in fact I've already started spreading the word!! Photo calendars are not only useful, but they make a thoughtful and sentimental gift. It's all very well and good storing all of your appointments on your smartphone, but there is something so satisfying about writing them down and seeing them on your wall as you walk past. Design your own calendars with your favourite photos, and enjoy organising your life in a unique and memorable way. So many people would love to receive their own printed calendar. What Will My A5 Calendar 2019 Actually Look Like? Get your 2019 off to a great (and organised) start by designing your own printed calendar. Our photo calendars printing service allows you to create stunning, high definition photo calendars, featuring all of your favourite images. You will receive a pack of two calendars in your order - ideal for large and busy households. The handy A5 size is compact yet makes a great statement. As with many of our products, there is a quantity discount when you buy calendars. When you buy more, you save more. Get in touch to discover more about our generous quantity discount. The discount will automatically be applied in your basket. The calendars are spiral bound, making it easy to flip the months over. The handy hanging loop allows you to hang your calendar freely on a hook or nail. You could even prop it up on a desk if you want to keep one of your calendars at work. Made with thick, glossy paper, the print of your photos is exceptional. Fine lines and details are depicted clearly, and the colours are crisp and vibrant. You can choose to start your calendar from any month you wish, and can even add a line of text underneath every photo. The design of the calendar is clear and very easy to read, giving you just enough room to jot down important dates. Can't choose your favourite photos? As this is an A5 size calendar, both single photos and photo montages look stunning printed on the paper. Use our fun photo montage tool to create your perfect layout. This tool allows you to choose from several different montage designs, including a scattered effect, heart pattern, photo frame and more. This montage effect looks particularly striking when used for the front cover. Why not design one as a gift from your children to their grandparents? Upload a different photo of the kids for every month and create a gift that they can show off to all of their friends (all grandparents LOVE showing off photos of their grandchildren!) For parents who have to work long hours, create a calendar featuring photos of the whole family. Choose holiday snaps, special occasions and more and make a calendar that they can use at work and enjoy looking at. If you are looking for a gift for a teacher for Christmas or the end of the school year, then an A5 calendar 2019 is ideal. Upload photos of the children from throughout the school year and watch their eyes light up when they flip through it.